Chef C.J. Jacobson, Top Chef Season 3 alum and winner of Top Chef Duels, is no stranger to the Chicago restaurant scene; his highly regarded River North restaurant Ēma, meaning “mother” in Hebrew, has been dishing out delicious vegetable-focused Mediterranean plates since its opening in the summer of 2016. Jacobson first became deeply inspired by Mediterranean flavors and ingredients while traveling during his athletic career, which brought the former professional volleyball player to Belgium, Israel, and the Netherlands. Aba, translating to “father” in Hebrew, serves as an extension of Jacobson’s Ēma; his second restaurant similarly centers on ingredient-driven Mediterranean cooking, yet with a greater emphasis on protein, both in its raw and cooked forms. 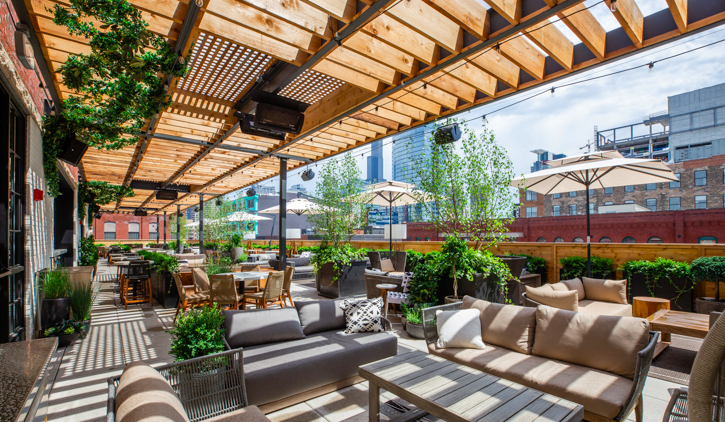 Since its opening last August, Aba has rapidly become one of the most popular restaurants in the historic Fulton Market district, with its success reflected in the difficulty of obtaining a dinner reservation even weeks in advance. 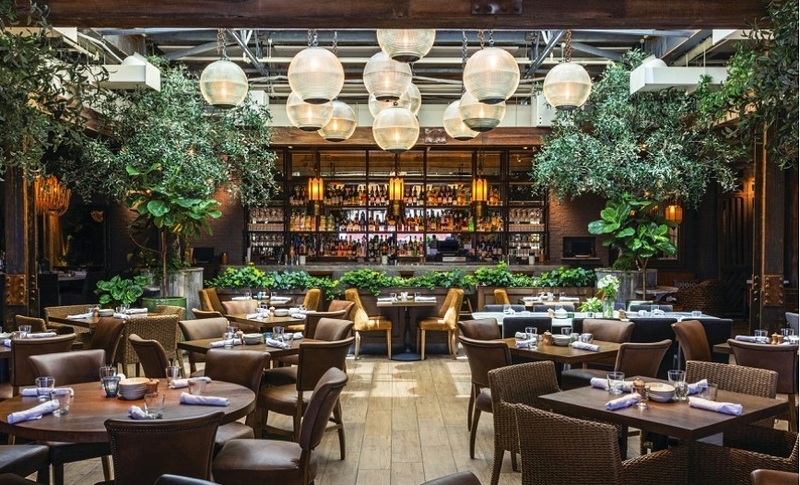 With warm string lights, lush fig trees, and potted plants decorating the strikingly beautiful dining room, Aba’s cozy and industrial-chic environment is reminiscent of an elevated garden dinner party. The inviting decor creates a space filled with lively summer energy, which we welcomed warmly on a particularly cold and late February night. Each table we passed while making our way to our own had a bountiful spread of dishes laid out before the diners, and the aroma of fragrant spices wafting in the air only added to our anticipation of a delectable meal. Shareable small plates with a focus on mezze-style meals is at the heart of Aba, which is broken down into sections such as spreads, hummus, cold or hot mezze, kebabs, and an extensive list of various preparations of proteins on the menu. Diners are encouraged to order two or three plates per person at the table, which we found surprisingly difficult due to the impressive selection of dishes offered. Aba boasts six different types of housemade hummus, including the classic served with za’atar and vegetable crudité, the spicy topped with marinated fresno and sweet roasted chilies, as well as more unconventional hummus dishes such as the pumpkin hummus made with brown butter and nutmeg and topped with roasted pumpkin seeds or hummus topped with crispy short ribs, grilled onions, and beef jus. Aba’s protein-driven menu considerably differed from Ēma’s; the menu features a diverse range of meat and seafood dishes such as sumac-glazed pork belly, slow-braised leg of lamb, char-grilled lamb chops, black garlic shrimp scampi, Ora king salmon, and grilled octopus. The dessert section is composed of dishes that similarly reflect the restaurant’s strong Middle Eastern influence, such as frozen greek yogurt with olive oil, kulfi (a frozen dessert similar to ice cream but creamier and denser) flavored with turkish coffee, and double chocolate tart with Moroccan mint. While we spent a fair amount of time indecisively perusing the menu and prolonging our hunger, we thankfully did not have to wait long after ordering for dishes to begin arriving at our table. We began our meal with the classic hummus, which came with a lightly seasoned array of crisp vegetables such as watermelon radishes and heirloom carrots and a basket of dangerously addictive warm housemade bread brushed with extra virgin olive oil and za’atar. Crispy, fried chickpeas studded the smooth hummus and provided a welcomed textural component to the dish. The hummus itself was generously topped with paprika and a drizzle of sharp olive oil that added to its luxuriously creamy mouthfeel. We continued with the kanpachi, which was served raw with charred avocado, greens, and heirloom cherry tomatoes in a bright and acidic aji amarillo sauce that provided such complementary depth of flavor to the fish. For proteins, we settled on grilled octopus and braised leg of lamb, both of which served as a hearty way to finish our meal. The octopus was texturally perfect-- its tender interior allowed for easy portioning, while its charred, crisp exterior provided a deep smoky flavor to the entire dish. While I am personally not the greatest fan of frisée because of its bitter taste and texture, the freshness of the greens helped lift the otherwise heavy dish. We did not particularly enjoy the romesco sauce served with the octopus, as we thought it lacked flavor and did not seem to add anything but color to the dish. The braised leg of lamb was wrapped in eggplant and sat in a spiced, stewed tomato sauce that had a sweet and savory twist from soft pieces of medjool dates and warm notes of cinnamon. Not only did the tomato sauce flavor the lamb, but also served as another perfect dip for the housemade bread. The lamb itself was well-seasoned and incredibly tender, and ultimately made this dish a table favorite. While the restaurant’s sweet options were incredibly enticing, we found ourselves wanting to pass on dessert following the indulgent savory courses. We left with an agreement to return, only next time we would most certainly leave room for dessert.